Bad measurement in design (width of the receiver was not accounted for in trim). The width of the opening is large enough for the receiver but the trim pieces make the opening 3/8” too small to fit receiver (right side). Looking for suggestions to fix this without tearing entire thing apart. All trim is glued and screwed with pocket holes from the backside. Ended up unscrewing the top of the receiver and lifting it off the main unit. I could then tilt the receiver into place and slide the lid back on. DOH! I hate it when that happens. How is the back attached? Can you remove it and slide it in and then reattach? It looks like you plugged the pocket holes, so that would make it even more difficult to remove the trim. Worst case is you cut a hole in the back or buy a smaller receiver. And it won’t fit through the opening diagonally? Can you simply cut that strip on the right side off, slide the receiver in and then attach a new one (for aesthetics) with some brads or screws? Here is a better photo of the shelving as a whole. The unit was built separately then set into a recess in the concrete wall. All of the pocket holes are on the backside. can ya tilt the receiver to get it through the trim and set it inside? No it is too tight of a fit to tilt it. I’d be shopping for a new receiver. And cut the divider behind it too, of course. Not sure what that does to the integrity of the remaining shelf piece, but it may not be an issue. If it is, retain some portion of the divider? Or even remove face trim piece circled, then cut divider and slide it over (left) one inch. insert receiver, replace face trim with screws to divider. Not the ultimate fix, but better than tearing out? I feel like I’m not understanding something, the opening is large enough but there’s a small piece of 3/8 trim you have to get past to make it fit? It would seem like putting it in diaganol should do the trick…? Shopping for a new receiver likely won’t work. If it’s a quality home theater receiver, there is an industry pseudo-standard size. 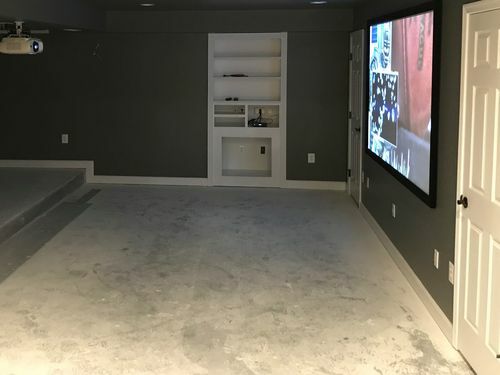 Having worked in the home theater industry, we always told the carpenters about minimum clearances needed first. 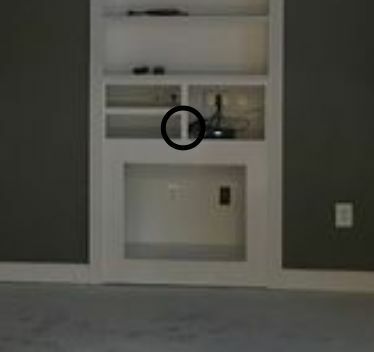 I want to know, can the unit be pulled out of the recess to gain access from the back panel? That would be the way we would have addressed the issue when I was doing installs. Otherwise, the face frame has to be wrecked. 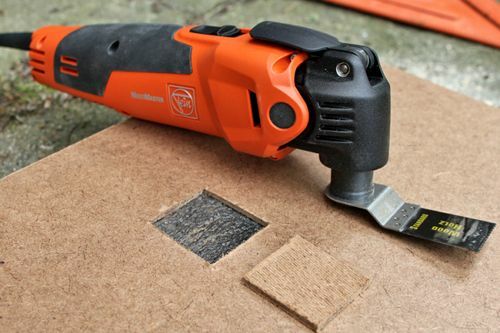 This , use a router for most of it, finish with saw, chisel, or multi tool works well. Lots of good suggestions, but I think this could get pretty ugly. Any solution that lets you get the receiver in place and restore the trim is just setting you up for another round of this trouble down the road. I know that I need access to the back of my AV equipment on occasion as technology advances and new gear is acquired. For example, swapping out the DVD player for a Blue-Ray unit required swapping a lot of cables to keep all of the components happy with each other. I have stood on my head with a mirror and flashlight in hand to know where this all leads. As tough as it may seem, I recommend going with one of the suggested fixes that will allow you easy access to the back of the receiver in the future. Unfortunately, “simply” removing the trim around that one opening is probably not going to be to your liking since I assume that the other openings also have the trim. You may have to remove the trim on the right side, and take out the center divider, shelf and trim on the left and then install a new divider and shelf to bring everything back into a common theme. Or….. Put the receiver on the shelf above the intended opening and use the original space for another purpose. 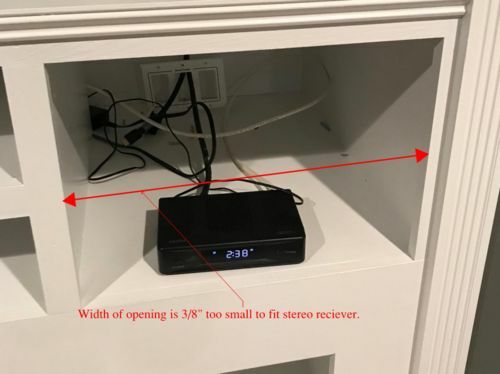 The easiest solution is to put the receiver on the shelf above. Or you could sell the receiver and replace it with an amp or integrated amp that will fit. Amazon actually has some Asian tube amps that will fit that are affordable and sound a whole lot better than most solid state receivers.